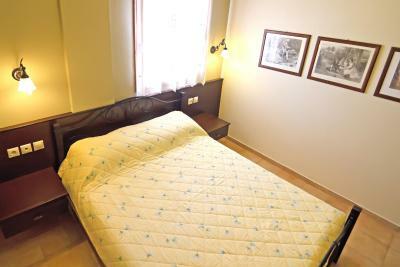 Lock in a great price for Minos Pension – rated 8.7 by recent guests! Great location in the Old Town. Easy walking to all the sites. Maria was very nice and gave me a room upgrade. The property is very well kept. sadly it was early in the season so they were doing maintenance on the roof terrace but my upgraded room had a partial view on old town so it all evened out. I would certainly stay again as it was good value over all. 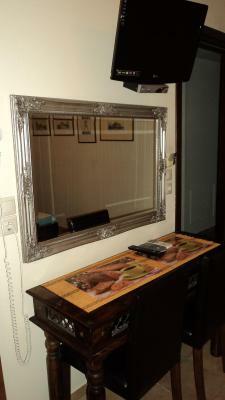 This family run hotel was good value the owner and staff are welcoming and friendly I recommend this place to anyone who wish a quiet place to stay but with a short walk get into the bustle of the town. 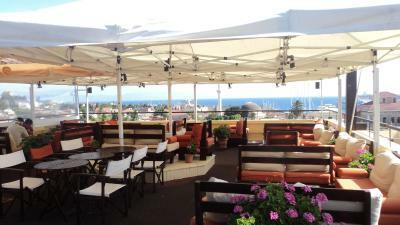 The view from the roof garden is spectacular , have your camera ready. The terrace is amazing.It's relaxing and comfortable.It was difficult to leave the terrace ;-) We also loved the breakfast time with the view of the terrace! The menu has a lot of varities for every taste. 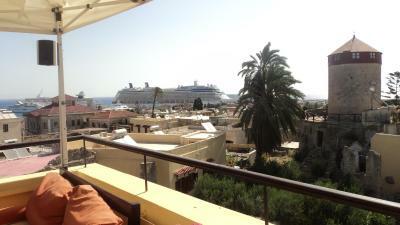 The view from the bar is the best in Rhodes. 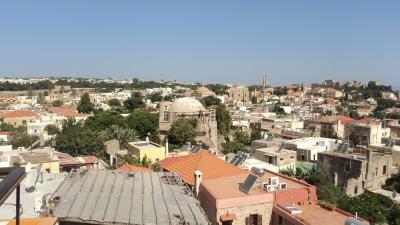 When we arrived we were upgraded to a larger room with a view of the city. Maria is a wonderful host. Patricia is an amazing person, so is Minos, they are always helping and working for you. 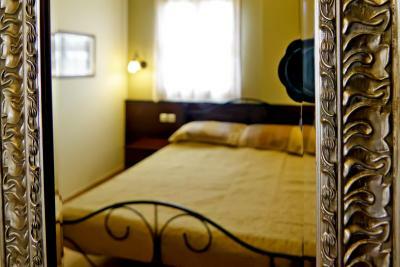 Minos Pension is your home at Rhodes, literally. 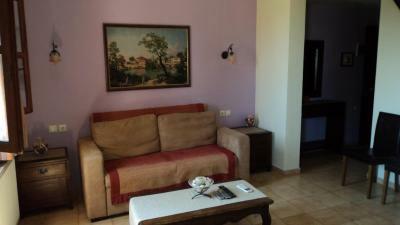 So cozy, superb views, cool athmosphere, friendly neighbors, unbeatable location. Lovely location. Patricia was very friendly & helpful. 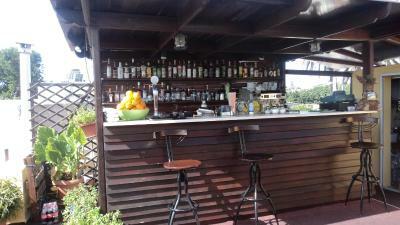 It’s a very cute place in the Old Town, it has a great terrace to watch the sunset, it was very clean and Patricia from the staff was extra helpful! 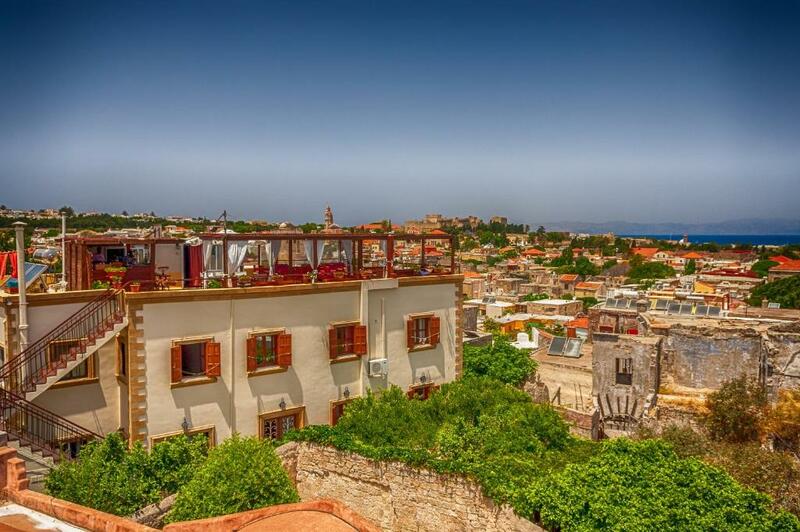 One of our top picks in Rhodes.Located on the highest point of Rhodes Old Town, Minos Pension has a rooftop snack bar with views of the Old Town and the Aegean Sea. Shops and restaurants can be found within a 3-minute walk and the nearest beach is within an 8-minute walk. 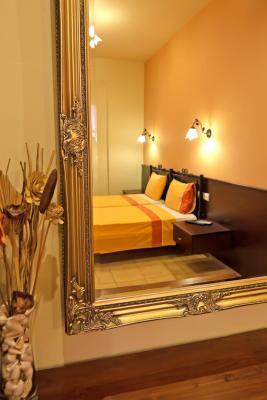 Featuring modern décor, all air-conditioned rooms and studios offer free Wi-Fi and an LCD satellite TV. 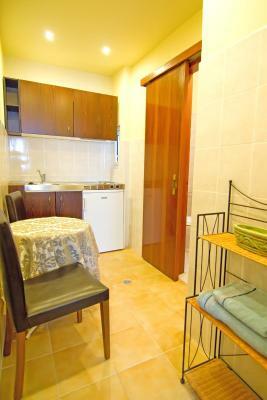 Each private bathroom is stocked with a shower and hairdryer. 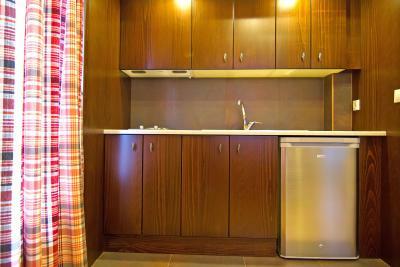 Some units also include a kitchenette with cooking rings. 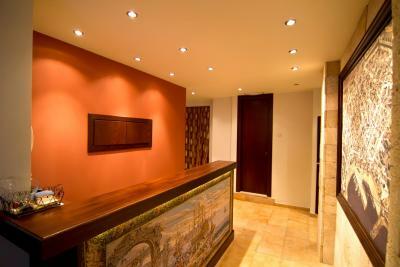 Guests have at their disposal a communal library and a lounge area in the garden. Car rentals and taxi services can be arranged. 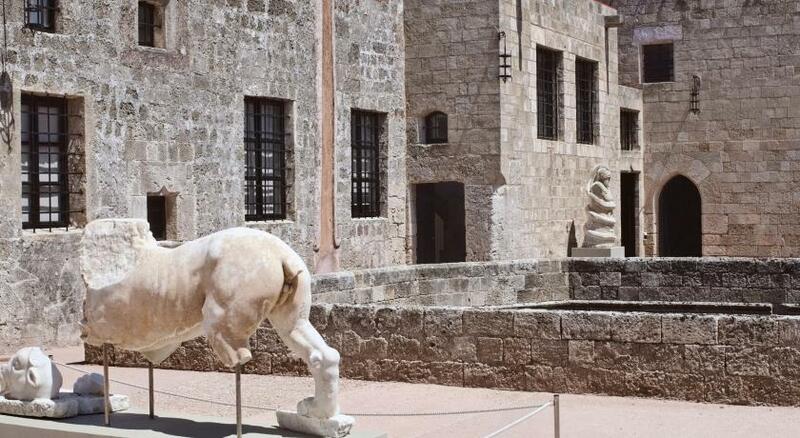 Staff at Minos Pension can provide information on local sightseeing, such as the Grand Master Palace of the Knights. Diagoras International Airport is around 12 mi and the lively Faliraki at 9.9 mi. Free parking is available nearby the property. 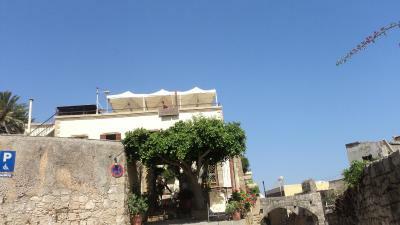 뀐 Located in the real heart of Rhodes, this property has an excellent location score of 9.3! 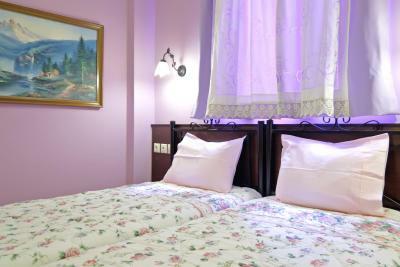 When would you like to stay at Minos Pension? 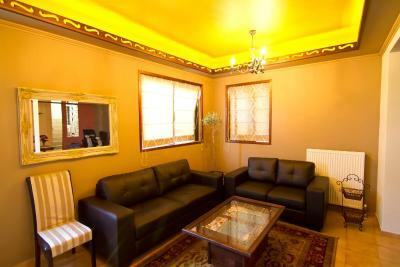 This air-conditioned room offers free Wi-Fi and an LCD satellite TV. 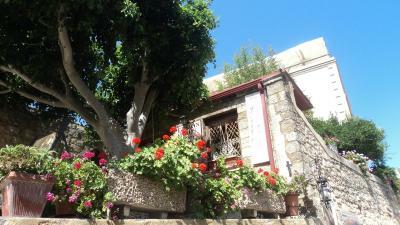 This air-conditioned studio offers views of Rhodes Old Town, the sea and the garden. It comes with free WiFi and a kitchenette with cooking rings. It also features an LCD satellite TV and a hairdryer. This air-conditioned room offers views of Rhodes Old Town and the garden. 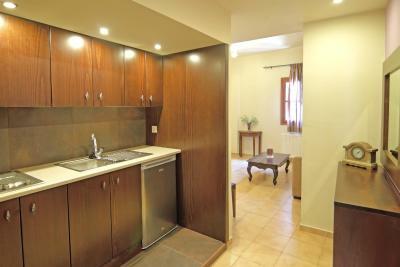 It comes with free WiFi and a kitchenette with cooking rings. It also features an LCD satellite TV and a hairdryer. This air-conditioned room has a small window. 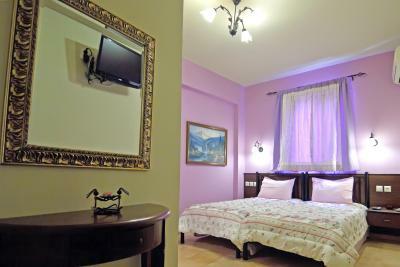 It offers free Wi-Fi, an LCD satellite TV, refrigerator and a kettle. This room cannot accommodate any extra beds or baby cots. Kindly note that this room does not offer a view. 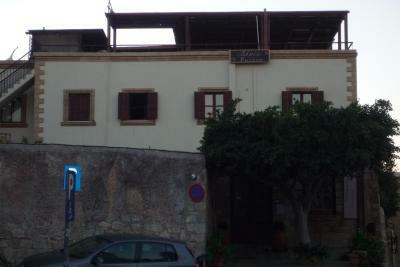 Upper floor studio with 2 windows and a shared balcony facing Agioi Theodori Byzantine church. Ground floor room at the back side of the property. Has 2 large windows and no views. 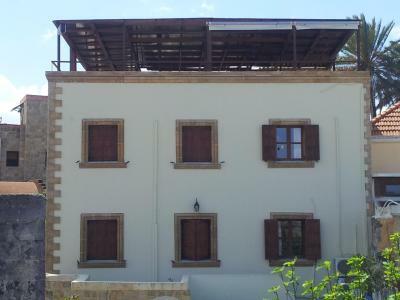 Minos Pension is built by the owners, John & Maria Lentis in 1987. 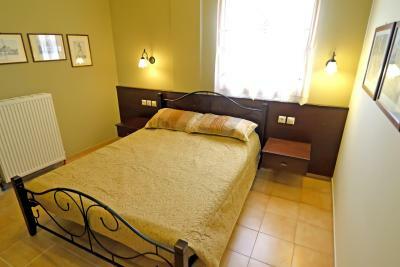 Since then John & Maria’s family offers to their guests their hospitality and warmth in such a nice and clean accommodation, in a friendly atmosphere and very competitive rates! 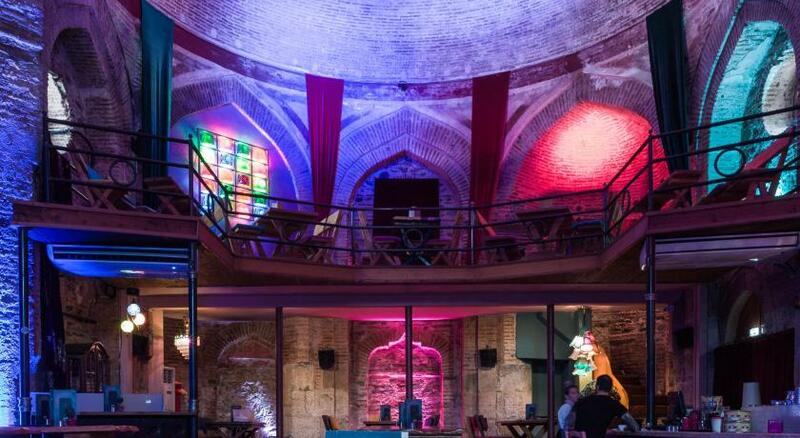 Major rennovation in 2011 Minos is located within the medieval walls at the highest point, opposite to an old big wind mill and next to S. Theodori Byzantine Greek Church, at the beginning of Omirou Street. 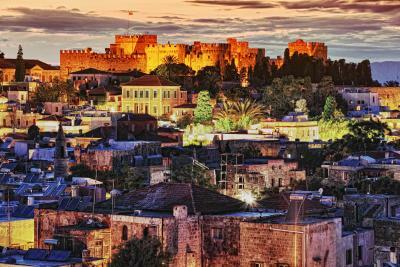 Here you will feel the magic of staying in a great and lively old city. 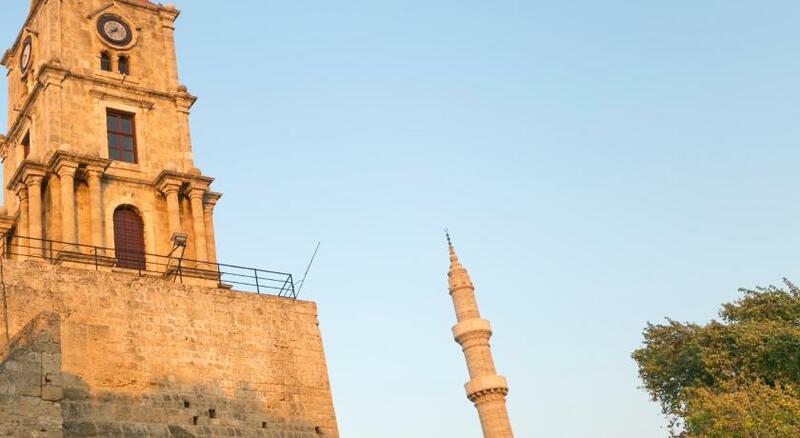 You will enjoy the ancient glory and the peaceful atmosphere arrived from Middle ages, in a breathing distance from the Castle of the Knights with the tower of the clock beside, the minarets and the mosques, the Aegean sea and the mountains of Turkey at the background. This place is suggested by the most reliable guide books in the world, including Lonely Planet (in 13 translated versions). 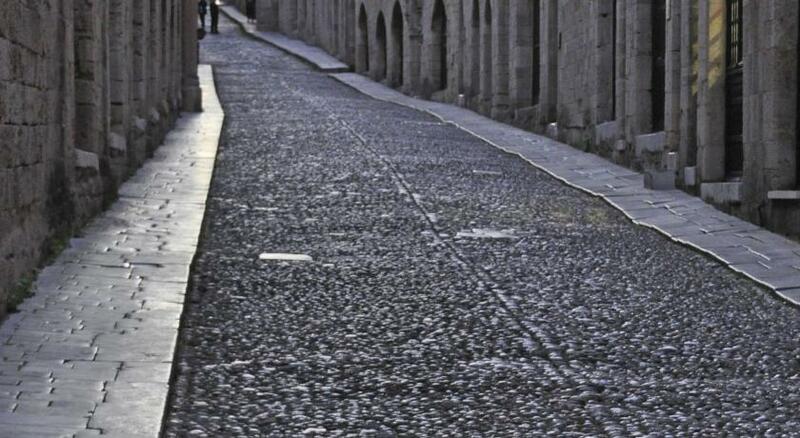 The Rough Guide lets go to Greece formers, the Routard, etc. House Rules Minos Pension takes special requests – add in the next step! Minos Pension accepts these cards and reserves the right to temporarily hold an amount prior to arrival. Just note that you have to walk about 3 minutes from free parking just outside the walls. May be an issue for some with bags etc. 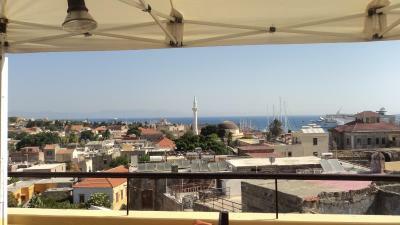 Everything was perfect, the hotel is situated in the old city center with a great view, Minos is very kind and always here if you need anything. Definitely worth it!!! 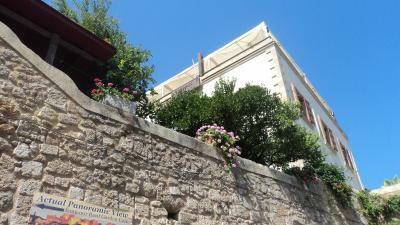 Minos Pension is a great place to stay in Old Town Rhodes. The staff and the family are great!!! The Rooftop is so nice to have breakfast and watch the sunset. You are only 10 min at most from anything in Old Town. Also, close to many doors out. Hope to go back someday! Nothing. Minos Pension was awsome. Minos is a great guy. Nothing was any trouble and he even gave us an upgrade to a nicer room. 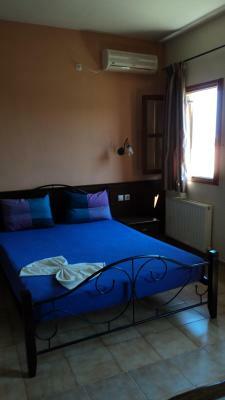 The rooms are spotless and the pension is in a great location with the old town's best views. 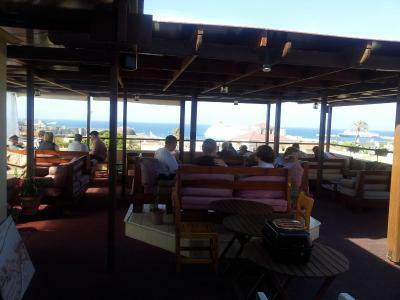 The pension is just a lovely short walk from the hustle and bustle and a lovely roof top area to enjoy a meal or a drink. 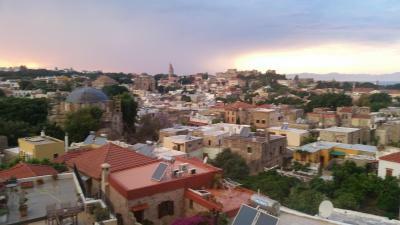 I wouldnt stay anywhere else in Rhodes for location and value for money. It was a little while away from the beach as we were walking there everyday, but it did give us a reason to exercise! Main entrance to pension not obvious-no sign on door. Good location in old town . 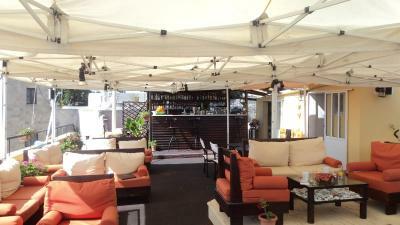 Quiet area but only a short walk to shops and restaurants and generally busier areas. Very friendly and helpful staff. 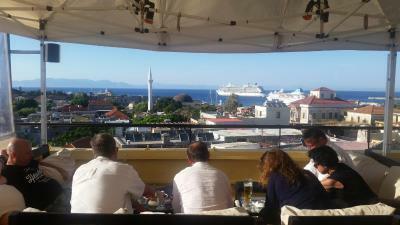 Great view across Rhodes town from breezy roof top bar which had snacks, drinks and very comfortable seating. Owners were very happy to look after our luggage for most of the following day before we had to travel. 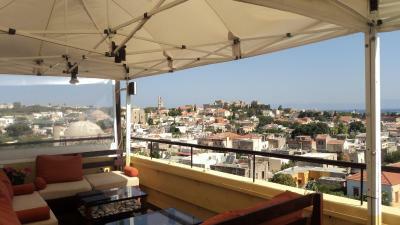 + Excellent location in the old town + Very friendly and helpful staff + The view from the roof top was beyond amazing! + Our room was small, but had everything we needed, and was very clean + Free water and soft drinks in the fridge + Very good breakfast at a reasonable price + Fantastic value for money! 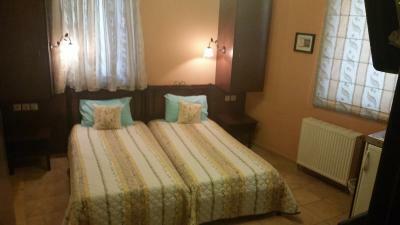 We had a wonderful stay, and would not hesitate to come back!